In continuing the series of special feature interviews with owners of some of the other species of toucans out there, I’m excited to present you with our newest toucan friend. In case you missed my first interview with Touk the Green Aracari, be sure to check it out – he’s quite the character! Today you will have the pleasure of meeting the adorably entertaining Pixie, a Swainson’s toucan, who is much closer in size to our Paco, Paz, and Pepe. Swainson’s, or Chesnut Mandible, toucans are the second largest in toucan species, just slightly smaller than our Tocos, generally weighing about 1.3 lbs. In the toucan world, there are croakers and there are yelpers. You may be familiar with our Toco’s croaking sound. But Swainson’s are yelpers and have a much higher pitched call. Swainson’s are the most popular of the large toucan species to be kept as pets, due to the fact that they breed relatively easily in captivity and are quite hardy birds. Swainson’s toucans are not endangered and are considerably abundant in their native territories of Central America down to Columbia. They are also similar to our Tocos in the sense that they are not sexually-dimorphic birds, with both male and female Swainson’s alike in appearance. 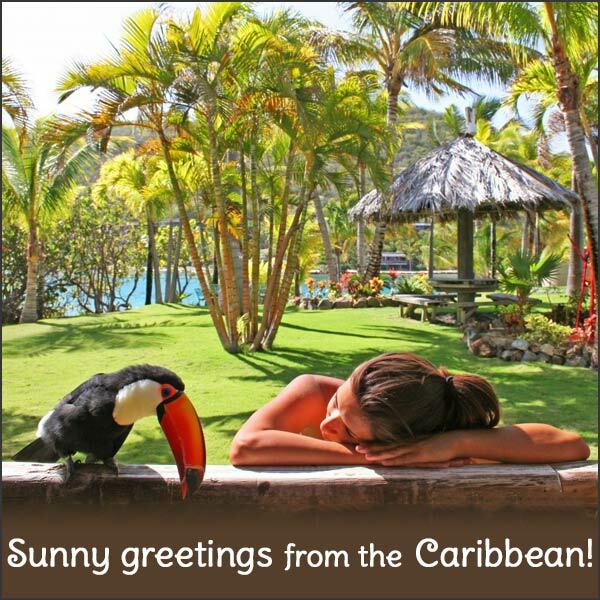 Pixie is the frolicsome toucan pal to Jen and her husband, Jamie, who live in Western Canada. Pixie is a 7 year old Swainson’s whom they adopted when she was 2 years old. I met Jen through You Tube where we both shared our amusement of each other’s toucan videos, fascinated by the similarities between Pixie and the Three-Cans. Species aside, there are some things that are just toucan things – goofy nuances that you can only really relate to when you have the unique experience of spending your life with one. Now, I’ll let Jen take the mic and share with you her toucan love, Pixie. Hi, Jen! Where did you adopt Pixie? How was your adoption process? We adopted Pixie from Emerald Forest Bird Gardens after a lengthy two-year process of research, decisions, and finally importation paperwork. We needed to make sure a toucan was the right pet for us, as well as be confident that we were getting a legal and well taken care of bird. The hardest part was filing the paperwork with the Canadian government. What made you decide to adopt an adult bird, rather than a baby? Was it difficult to adjust her to the life change? We didn’t specifically want an adult bird, but that is what was available at the time. Apparently, as per Emerald Forest Bird Gardens, a magician had owned her but he couldn’t get her to do some of the tricks…so he took her back to the breeder! It wasn’t difficult to get her adjusted. I think it took ME longer – I was so afraid that I would do something accidental to harm her (just like any new mom thinks…hahaha). She was completely comfortable in our home within a couple of days. Have you ever owned any birds prior to Pixie? How are toucans different compared to your experiences? I have not. In fact, Pixie is my first real pet (not including a newt I once owned). My husband, Jamie, however has had many pets ranging from dogs, bunnies, small birds, and an iguana. There are a couple of reasons why we specifically picked a toucan to add to our family: they are hypo-allergenic, have personality, and love affection. Pixie has actually bonded with us, and the three of us are a “flock”. We like to compare Pixie to having a cat because she is a little moody – sometimes she wants nothing but to cuddle, and other times, she has no interest in us and just wants to hop around and be curious all on her own. What is a typical day in your life with Pixie like? Pixie is the center of our lives. We have placed her cage in our living room, where we spend most of our time. We have daily “chores” for her: we cut up fresh fruit (mostly papaya), change her water, and clean her cage. Every morning, we visit Pixie as soon as she wakes up – she is extra affectionate during this time and still, after 5 years, keeps melting our hearts. Nothing beats a little Pixie purr when you wake up on the wrong side of the bed! I work at home, so I get to say hello to Pixie multiple times throughout the day, while hubby goes off to work. We take Pixie out of her cage every evening and, depending on her mood, encourage her to play and fly around as much as possible (Pixie’s wings are not clipped). When it’s time for bed, she goes back into her cage and we cover her for the night. Pixie is very curious. We try new “toys” with her all the time. Although we hang infant toys in her cage, we also make random things for her. Things she can stick her beak into and find treasures, things she can whip around, and things she can shred a little bit. Right now, Pixie LOVES her Lamaze octopus (infant toy) and a skinny squeak toy we put in a paper towel tube. Once a week, we do the “big cage clean” and scrub down the cage. To Pixie, this is playtime. She watches our every move and tries to take the tools/cloths we’re cleaning with. It’s cute, but we don’t really want a dirty rag in her mouth so she never gets the “toy”. We’ve had to deploy clean “decoy” rags when she’s extra determined, or even move her to her travel kennel so we can clean without her getting into trouble. Have you trained Pixie to do any special behaviors? Was it difficult? We have trained her to go to the bathroom at her cage, but that is it. We do find it difficult…we’ve had to be 110% attentive and respond with a raspberry (her favorite treat) immediately…it took several months of this to really notice her adapting. What is your favorite thing about having Pixie in your lives? Keeping up with her messiness! She flings her fruit when she’s eating it and it gets everywhere. I’ve been walking by when she’s got a raspberry and suddenly, I have raspberry on my shirt. I clean the walls and within the next week, fruit bits have already reappeared. I would absolutely recommend it – to the right people. I would make sure they know that having a toucan is like having a toddler. You need to make sure she is happy all the time by feeding her properly, interacting with her, and cleaning up after her. We spend 2-3 hours per day dedicated just to Pixie. It is a big commitment, but a very rewarding one. A big thank you to Jen, Jamie, and Pixie for sharing their lives with us! All of the photos in this article were provided by Jen & Jamie. You can also find the Pixie videos shown here, as well as plenty of others that will bowl you over with Pixie charm on Jen’s You Tube Channel. Stay tuned for more interviews from other species in the toucan family and be sure to let me know if you have any requests or if you know someone who would like to participate. This entry was posted in Friends of Toucanland and tagged Adventures in Toucanland, bird, birds, BVI, Caribbean birds, chesnut mandibled, Emerald Forest, Emerald Forest Bird Gardens, exotic birds, exotic pets, island, Paco, Paz, Pepe, pet, pets, Pixie, Saba Rock, Swainson's, Swainson's toucan, Toco, Toco Toucan, Tocos, Toucan, toucan videos, toucanland, toucans, tropical birds, tucan, tucans by Toucan Lady. Bookmark the permalink. I loved reading about Pixie! The pictures and videos are awesome! I was wondering about her former life. What tricks did she learn I wonder. It was easy for me to teach Touk to catch and then throw the ball. He learned it in a minute. I have not even tried to teach him anything else. I think being able to potty train an adult bird is awesome!!!!! Touk almost never poops on me but does every where else. The few times he did I let him know I did not like that and so he stopped. I love seeing a re homed bird so happy! Pixie is beautiful happy and smart. Please keep all the stories coming I love what you are doing Chrissann!!!! Yes, I am interested in a Keel Billed Toucan and would like to see an interview of that particular species. Also, I have found your website to be very informative for me and want to say thank you. There isn’t enough Toucan care information out there. Oh and might I suggest that you do an article about the downsides of owning a toucan? I haven’t yet gotten through all of your website so I don’t know if you’ve done this before or not. But I think that if people knew the negatives to owning a pet along with the positives that there would be a lot less abandoned pets in shelters and such. So I am looking for information on all the negatives on toucan ownership to truly gauge if a toucan is right for my family. Thanks for your feedback. I’m glad you’re enjoying my site. You will be happy to know I already have a Keel-Billed interview in the works, so stay tuned! Your other note is a great idea, one I have thought about before, so I will make it a priority and do a post for you soon on the full reality of having a toucan as a pet. In the meantime, if you have any specific questions, please feel free to post them on this site or email me at toucanlady@adventuresintoucanland.com.